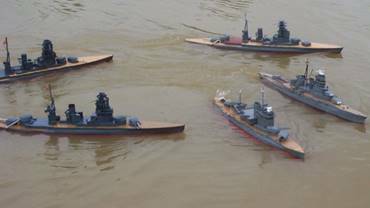 What is Model Warship Combat? Model warship combat is a game of simulated navel combat from ships built between 1906 and 1946. The radio controlled ships are armed with bb cannons with the purpose of shooting and causing actual damage to thin balsa wood sides of other ships and ultimately trying to sink them. The governing body the International Radio Controlled Warship Combat Club (IRCWCC) is a non profit organization dedicated to creating a structure to safely carry out the operations of model warship combat. Below is a compilation of frequently asked questions. What is Port Polar Bear? Port Polar Bear is a regional division of the IRCWCC located in and around Minneapolis Minnesota. We battle said scale warship locally and frequently travel to different parts of the country for regional and national events. In the summer we typically battle at least once per month. When the pond is frozen we will frequently get together to improve our existing and build new ships. A "FAQ" (pronounced fack) is a text file where Frequently Asked Questions (FAQ) are stored for people interested in a subject being discussed at that location. In the case of this FAQ, it pertains to frequently asked questions within the Model Warship Combat organization. Do the models actually sink? Yah, you betcha. In fact, we tend to tune our rules based on the frequency of sinks. According to our rules all combatants must be sinkable. As we tend to fight in waters shallow enough for wading, sunken ships are normally found and recovered quickly. Why would anyone allow their model ship to be shot up and sunk? Because it’s awesome!. And what goes around comes around, you get to shoot up and hopefully sink someone else's model ship as well. If your technical and tactical skills are fairly good, then you won't sink that often. But you do have to put your ship on the line in order to sink someone else's! Are the ships easy to repair and how do you do it? The ships are designed and built to take the punishment, and are generally very easy to repair. Usually a repair is no more than covering a bb hole with a silkspan patch (very much like tissue paper but stronger) and a light covering of glue or quick-drying paint. When dry, the hole is patched. Isn't water bad for your electronics? The sensitive electronics, including the bulk of the radio equipment, are usually protected from the water, either through the use of watertight boxes, or by some other form of waterproofing. The electrical drive motors aren't usually protected, as it's not too hard to find inexpensive motors that aren't bothered by exposure to water. Why don't you arm all of your main guns? There are several reasons. For one thing, packing a bb cannon in for each main gun can be difficult given space restrictions on the inside of the ships. Also, one of our rapid-fire bb cannons is more than enough to sink another ship if it can be placed on target. Another reason is to keep some sort of scale power in terms of the ships we are modeling, a WWI battle cruiser shouldn’t have as many guns as the Yamato. Plus there is added technical complexity and cost associated with each additional gun that would make our hobby unobtainable for many beginners. Why do you need pumps? Partially for safety reasons. In an effort to keep the power of the bb cannon systems down, the sides of the ships are sheeted with 1/32" balsa wood, to allow easy penetration. But since we're building and battling battleships here, we don't want a single hole to sink our beauties. Thus, a captain has the option of using pumps to simulate the punishment absorbing capabilities of the full-sized prototypes. The ship has to take enough hits to overcome the capacity of his pump(s) in order to sink. However there is not currently any rule that determines the ratio of pumps to guns that you may have. How fast do the ships go? Each type of ship is rated at different speeds. The speeds have nothing to do with how fast the real ship could go. Way back when this all first started a speed was picked that made the bow wake look sort of realistic and it was manipulated only slightly from there. A reason that historical speeds are not used is that various sources give various numbers on the actual capabilities for various ship, based on propaganda, combat conditions, sea trials, etc. Since it was easier and allows for relative power scaling, speed is based on type of ship and length. This works out to mean that in general slower ships turn better then the longer, faster ships. It keeps things relatively well balanced. In practical terms, all ships driven on a 100 foot course. The ship must complete the course no faster than the time allowed for said ship. Battleships and Battlecruisers are rated at 28, 26 & 24 seconds over that course. Cruisers are rated at 23 seconds. Destroyers and some small light cruisers are 22 seconds. Convoy ships are all 34 seconds. Keep in mind that the lower the number the faster it is. For the typical fleet battle: Teams are decided in some way (see below). The ships are put onto the water and usually they begin to group up next to their teammates. When everyone is on the water and ready battle is called and you go at it. Each gun has 50-75 bb’s. When you run out of ammo you call “five” which is a five minute time period where you have to leave your ship on the water and can evade fire, but you can’t return fire (again, usually you are out of ammo at that point). The point of the five minute defensive period is to discourage people from doing suicide charges and give everyone a chance to play the game in a reasonable manor. When your timer is up you can pull your ship next to shore and take it off of the water. Battle goes on like that until everyone on one side sinks or have been through their five minutes and are pulled off the water. The team with ships remaining on the water then pull their ships off, but they are not necessarily the winners. The ships are then re-armed, can change batteries, and non hull skin, bb-caused damage can be repaired. After which you go back out on the water for the 2nd sortie, which carries on identically to the first. After 2 sorties the ships are taken off the water and at that point the holes are counted, and when combined with points awarded for sinks the winner can be determined. If you sank in the first sortie you are not allowed to put back out in the 2nd sortie (again discouraging completely reckless play). The damage to the hull, the holes you took from being shot by the bad guys is not repaired until after the 2nd sortie. Typically we will have enough time in the day to complete 3 full two sortie battles. So is this a free for all or what? How do you determine teams? Various battle formats have been tried over the years. Free for all is fun but difficult to score. Part of the challenge of battle is trying to get better over time, and without some degree of keeping score it is difficult to know how you are doing. Some guys have used colored or dyed bb’s so they can tell by looking in their opponents ships after words how they are doing, but in general once the bb leaves your boat you are not sure if it is going in or not a fair amount of the time. Playing on teams makes it a little easier to keep your own personal progress in check, but more importantly team play allows for team based tactics, like sandwiching a ship between you and your buddy or cutting off an escape route so your team mate can get shots. Another part of our hobby that is fun for people is the team based competitiveness of it and light hearted trash talk that can come with it, some of this comes with the axis vs allies format and some guys like battling only ships from a certain nation, while some like changing ships and nation from year to year. There are however no rules legislating that you do so, but when we can we battle axis vs allies. Also it must be kept in mind that several of the natiosn don’t fit easily into an axis or allied category, japan was allied in WW1 and axis inWW2 for example, and the French and Italian ships ended up on both sides of battle at different times during WW2. At nats we try as much as we can to battle axis vs allies so captains can try to bring ships to synergize well with their team mates. Preplanned axis vs allies nats also allows for a greater degree of coordination at campaign battles, where convoy ships are used as unarmed target ships. At times however the skill of battlers and number of ships don’t allow for that, most commonly at smaller battles like regionals or local battles. Blow outs are not fun for anybody, so the teams are quite often evened out based on a veteran or two’s opinion of the situation and relative power of various ships/captains, sometimes even picking teams like grade school dodge ball, but usually in secret so there are no hard feelings. How often do the ships sink? Depends on a multitude of factors, probably the biggest being how many ships are on the water at a time. Sinking a ship one on one is very difficult, you often need several ships working together to pin someone down in order to shoot them enough to sink them. Often sinks happen because of captain stupidity or mechanical failure. From 2002 – 2014 at MWC Nats for ships classed 4-8, on average about 25% of the ships will sink in any given complete 2 sortie battle (top graph). Of those that sank, on average 20% of them sink with light damage (less than 50 above the water hits and/or 10 below the water hits) (2nd graph). The trend would indicate that ships are becoming more reliable over time and not sinking as easily with very light damage. From the same data set, another indication that ships are becoming more reliable is that the proportion of ships that didn’t sink but had at least 20 below the water line hits is increasing over the past few years (3rd graph). How much damage does it take to sink a ship? Depends on the type of ship, the quality of construction, the quality of the hull skin and the size of holes it takes, the location of the hole (above or below the water), the quality and the number of the pumps, the number and quality of battlers present, how windy it is. From 2002 – 2014 at MWC Nats it took on average 82 holes to sink a ship classed 4-8. Interestingly, the trend is fairly flat from year to year with a few variations. How much damage does a ship typically take when it doesn’t sink? Depends on the same factors as above. From 2002 – 2014 at MWC Nats, ships classed 4-8 that didn’t sink had an average of 57 holes. Interestingly here, the trend would seem to indicate that ships have improved survivability/reliability on average over time. So you can actually fight battles just like Jutland or Surgio Straight? Why go to all this trouble if you can't fight like the real ships? The quick answer is this: we play a game based on scaled down historical ships, not a simulation of historical fighting principles. The game we play is really fun. Historically scaled battles would be fun in a different way but technology is the main limitation. The safety differences, limiting the gun placement, means that many ships are limited to bow and stern cannon firing, thus the classic naval maneuver of crossing you opponents' T now has exactly the opposite effect in our hobby versus real life. Targeting differences, with cannons being aimed by people not actually on the ship and sighting down the cannon barrel. This makes targeting enemy vessels much more difficult. The result is that we fight at ranges that are totally unrealistic in real life for anything other than a night battle (point blank). In 1/144th scale, the battlecruiser action at Jutland would have taken place with ships about 60 yards apart. We wouldn't hit a thing at that range with our model ships. Our ships aren't armored like the real ones, again for safety. Our ships must be easily penetrated. We compensate for this with pumps. Shells from a destroyer would bounce off a battlewagon in real life, not in our hobby. Our 'shells' are not explosive like in real life. Therefore magazine explosions and fires are rare events. One of our main objectives is to have fun while sinking model ships. Fun was the last thing on the mind of any man in the midst of a real naval battle. Real naval architects tried to design ships and systems that would withstand the worst an enemy could throw at them, and continue to function. Our people attempt to 'balance' systems to maintain a healthy level of sinks in combat versus total pulverization. In other words: if no one sinks: No fun, everybody packs up and goes home. If everyone sinks or suffers mega-damage: No fun, everybody packs up and goes home. Obviously we try to maintain the amount of damage dealt out to a 'reasonable' level. Down angled sidemounts, at the distances we fight at, are killers. Another of our objectives is to keep things simple and inexpensive. When people design fancy and expensive items that give them an advantage over people who don't have them, the items are usually outlawed. In our hobby, radar and radar-controlled cannons are totally outlawed. Why? Because we want everybody to have fun, not an arms race. The water is still at 1/1 scale. Trying to have scale speeds and scale maneuvering is very difficult. Thus we instead sail our model ships at speeds that are close to what is called "dynamic similarity", where both the ship and the model have equal Froude numbers. Doing this allows our models to behave hydrodynamically similar to the real ship. This is a difficult subject to explain without the benefit of a degree in fluid dynamics, and we get many comments from spectators because they think this speed is too high, but that's what we picked. But in picking this 'speed limit', we still have other concerns that are different from the real vessels. The actual vessels try to squeeze as much speed as they can out of the ship without compromising too many other aspects of their design requirements. As such the designers are fighting physical limitations only. Our model ships can easily reach very high speeds, and most must be 'regulated' in some means to the speeds we have selected. Most real ships did not run speed tests before a battle to ensure that they did no more and no less than some table said they should. Our model ships do have to do this. And as was mentioned before, this set of rules that we use evolved from the period of time when it was difficult to even hit another ship, let alone sink it. In that time we came to like the game and its differences because it was still fun. And the ships usually sink like the real ships, which is a real kick every time it happens, and usually results in cheers arising from the shoreline. The rule set we use started at the time when it was difficult to even get the bb cannons to fire reliably. As technology advanced, the rules changed, but always with the intent of keeping the game fun for both rookies and veterans alike and playable at the same time. When systems get too good, and we begin seeing too many sinks, or conversely not enough, then usually we try to adjust the construction of the combat systems to bring the game back into balance. What is the International Radio Controlled Warship Combat Club (IRCWCC)? 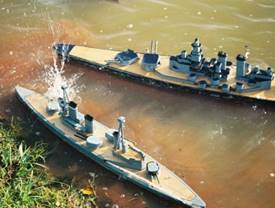 Radio Controlled Warship Combat Club (IRCWCC) is a non-profit corporation formed for the express purpose of building and fighting 1/144 semi-scale warships models from the World War I and World War II eras. The warships battle by firing bbs at each other. Safety, fun and good sportsmanship are the other high lofty goals to which we aspire. Which side has won the most Nats, what was the score and where was it held? That depends. For the first several years there was only one single unified club. Then later there were some personality differences that lead to a splitting of the club and the foundation of the Model Warship Combat, inc (MWC). 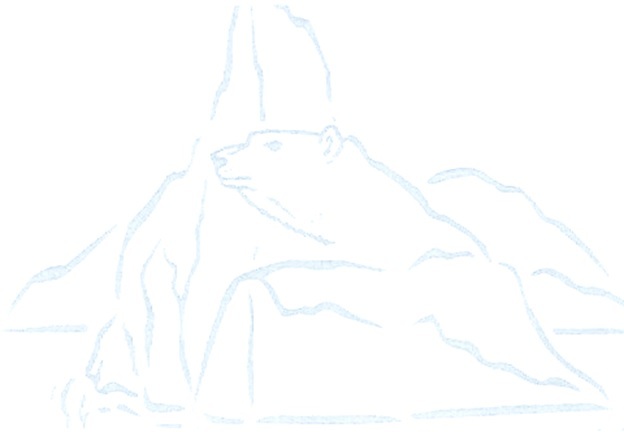 Port Polar Bear was a subgroup of the MWC from its creation in 1999 until it disbanded in 2014 and most of the members rejoined the IRCWCC. With all those bbs flying around, is it safe? Well, having remote controlled bbs flying around seems to be asking for trouble, be we try our best to think of safety. As mentioned above, the bb cannons are relatively low-powered, firing the bbs hard enough to give a good sting but not hard enough in to break the skin unless you are hit directly within inches of the gun. Thus our main concern is for eye-safety and eye protection is required. Otherwise we have other safety rules regarding ship construction, battle conduct, and pit conduct in place to try and keep the bbs down below eye-level of most adults. For instance, the destroyers and cruisers tend to roll quite a bit when they turn, and so bb cannons are only allowed to fire directly off the bow and/or stern on these ships, to cut down on the shots going high. No gun can have positive elevation. The guns must have safety pins when the ship is not in the water. Even with all of our precautions, bbs will bounce off of the water or another ship, and as such, eye protection for all combatants and spectators is mandatory. Where do I get kits or plans? Various fiber glass hulls are available, see the links portion of this web site to see more. Otherwise there are several vendors of plans such as Profile Morskie. The French government at one time had some scale plans available on a web site as well for free. Also, veteran captains will have collections of ship plans that they can often help you out with. What's better, fiberglass or wood hulls? The answer to that question depends. If you want a quicker, relatively easier to build ship, then a fiberglass hull is the thing for you. Fiberglass hull last as long as wood hull but do need the outer layer of gel coat patched where bbs have chipped it away over time. Not every ship is made in a fiberglass hull so the selection is limited. The weight is probably a little lower on fiberglass hulls and the ribs are thinner so there is often a little more room inside. Plus they don’t require researching ship plans in as much detail and don’t depend on your ability to cut straight or use fancy tools, a rotary tool is all it takes. There is a huge time savings with fiber glass as building a wood hull from scratch takes tens of hours to get the ship to the same stage as a fiberglass hull, before any of the internals are even started, where with fiber glass you can gut the hull out and trace the deck and get started on the internals faster. 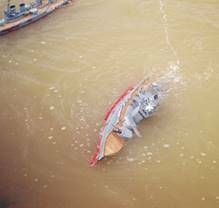 On the other hand, while a wooden hull is more difficult to build, and must be sealed carefully to prevent water damage, a well built wooden hull is probably more durable than a fiberglass hull. Another consideration for the veteran battlers (who are the ones who typically build wooden hulls) is that they don't have to deal with someone else's mistakes in research or execution when the fiber glass hull was built, but can rather research the best plans they can find and build ships which are as much works of scale art as they are warships. So, in the end, the answer to that question simply depends on what you want. If time is a concern or are worried about your building skills or tools you have available, then fiberglass is the answer for you. If you want a little something more or are looking for a unique ship or want a challenge, then perhaps you should consider plywood. There are also some guys experimenting with plastic CAD cut ships and 3D printing, though this is definitely not the norm. Where do I get fiberglass hulls? Fiberglass hulls are available for sale by individual captains and companies, see the links section. There are always veterans wanting to sell old ships to build a new/different one, so asking around is not a bad idea as well. Where do I get BB cannons? Check out the model warship specific vendors in the links section. Otherwise some veteran battlers will sell them to you or help you construct them. Yes you can. But the first guns you make yourself never work quite as good as the ones you can buy. Once you become a “Veteran” battler you will want to try to build your own. Kind of like a Jedi and a light saber. Are poppet valves or solenoids better? This is an older part of the FAQ, there are essentially no ships running poppet valves due to reliability and competitiveness issues, though there are still a few around. How do I mount the cannons to the ship? There are as many ways to mount cannons to the ship as there are captains. In general, if you are using a single cannon, it should be mounted so that it hits the water relative to the ship the same place every time. So the mount should be rigid and not allow the cannon to bounce around. Things that have been used for this sort of mount, that work fairly well are: zippy ties, wire ties, tabs soldered to cannon and screwed to decks, breach cradles, various clamps made from wood, plastic or metal. Multiple firing cannons (double, triple, quad) need to be fixed so that they hit near each other for best aim and effect. So some sort of clamp is needed to hold all the cannon in position. The idea is to make sure that they will not move relative to each other first, then with respect to the ship. How do I do a double/tripe/quad stern gun setup (multiple gun setups)? It is necessary that each cannon have its own valve. Multiple guns also require expansion or accumulation tanks to be sure the guns are not stealing CO2 from eachother as they fire. With multiple gun setups, each gun also needs to have the ability to fire all together and individually so they can be adjusted individually. An accumulator tank or expansion tank holds gas under full cannon firing pressure and sits next to the cannon valve. An accumulator tank improves cannon performance by providing larger gas flow to the cannon. Accumulator tanks are especially important when using multiple cannon setups. Accumulator tanks are typically made from copper and/or brass tubing but weight considerations must be taken into account. Are there different types of guns? Which is better. The “Foster” breech is the most popular and has several variations. It uses a piston to prevent the next BB from entering the chamber. The “tweak” or how hard the gun fires is adjusted by compressing an O ring. Different amounts of “tweak” are required for single vs multiple gun setups. The “Geek: Guns (tube breech) do not hit as hard but do not need to be tweaked as they have a fixed restriction and cannot be adjusted. Though it is simpler and requires less adjusting during the course of the day, they are not customizable to allow for different gun set ups and generally don’t shoot as hard, not many people use this style anymore. What are some of the common cannon failures? If a gun isn’t firing correctly each battler has their own troubleshooting protocol. I always start at the source and work to the gun: Electronics on, is the signal getting to the valve? Will the solenoid click without gas in the system. Gas on, is the air getting to the gun? Is a hose pinched or broken? Do I have BB’s in the magazine? Is there a jam, where is it, magazine, barrle? Check the O-ring and tweak. Take apart the breech. Check the magazine, open the magazine. If nothing else is obvious, open the piston chamber. With experience most veterans can tell what is wrong with the gun just by the sound it makes when it doesn’t fire. A vast majority of not quickly solved cannon issues (like I forgot to turn the gas on) are related to the piston. What's the best kind of battery to use? SLA (Sealed Lead Acid) are becoming outdated. NIMH (Nickel Metal Hydride) are still common. LiFE are becoming the new standard due to lower weight and higher energy density. Cost increases with each step up. Old fashioned SLA’s are still good enough for a lot of ships. It really depends on the ship’s combat needs (ie how many amp hours you need) and it’s weight. How many Amp Hours (Ah) do I need? If cost is no concern, you might as well make every available pound in your ship power it. There really isn’t a ship that needs more than 60 amp hours to make 2 sorties. Your best bet is to find a couple people with the same ship you are building and see what kind of batteries they run. What's better, 6 or 12 volt systems? 6 volt, most motors are made for 6 volts. Everyone runs at 6 volts. If you go with another voltage you’ll have trouble finding parts and nobody will have a spare you can borrow at a battle. What is a MAG throttle & ESC and what should I use? For brushed motors. A MAG throttle refers to they way people use a servo and two switches to change directions the drive motors are spinning. With two NO/NC (Normally open/Normally Closed) switches glued to the sides of a servo wired together you can reverse the polarity on the motors to get forward and reverse movement. This gives full power in both directions. An ESC does this electronically and also allows you to ramp up and down the speed of the motors. They do this by turning some of the voltage into heat while the rest of it goes to power the motor. They should be used for small adjustments in speed. Setting them to 50% forward power makes a lot of heat and can burn them out. If you use one make sure it is totally water proof and does not have a reverse break or delay as many RC cars have. Also make sure the amperage it can handle is not too low for your drive system. Most battle ships will not fry a 40amp ESC even under extreme conditions. Brushless motors are another situation altogether. What are some common motors in use today? Since speed is limited a standard surplus motor for $1-5 is good for the drive system. The best pump motors are “Stinger” or “Titan” motors from Traxxas, or some other brand of high speed motor. Brushless is becoming more popular but I wouldn’t say are the norm yet, also they require more complexity in setup. What are some common props in use today? Dumas 3112 & 3113 a three blade 2” prop or the Dumas 4 blade 1½”. Prop Shop from the UK has a variety of great cast props. Cast probs are better because they are cast and do not break very easy, but are more expensive. You can also buy or build soldered together props, they are cheaper but blades do break off when you hit something hard. The extra money spent here is worth it. What's the best brand of radio? Futaba, Spectrum or Airtronics. It doesn’t really matter too much, some guys have had success with the cheap radios from china (Hobby King). It’s best to get a programmable 6 channel radio, you’ll need it when you move up to a big Battleship (You will). See below, you need ground frequencies or 2.4GHz. How many channels will I need? Six for a battleship. Some smaller ships can use four. Should I run my receiver off my main battery? There are some advantages and disadvantages to running a radio receiver using a 6 volt ship battery. The primary advantages include no need to recharge a separate receiver battery, faster servo response, and saving the weight of the additional battery. The main disadvantages include the possibility of permanently damaging the receiver if not wired correctly, interference from electrical feedback from the ship’s systems, and completely losing control with weak batteries. An important consideration using this technique is to install electrical plug connectors that will prevent the receiver from being damaged by incorrect connection to the battery. The receiver must not be incorrectly connected, or it will be permanently damaged. Simply adding a Diode inline with the power source will prevent reversing polarity and burning things up. How do I protect my radio from water damage? In a water tight radio box is the most common way. Some people cast the RX in epoxy and don’t use a water tight box. What's all this about Air versus Surface frequencies? We have to use the ground channels and can not use air channels. Most people are on 75 mhz or 2.4ghz. Some captains also have 50mhz or HAM radios. Convoy ships run on 27mhz. Not much and it does not need to be pretty, according to the rules. Anything over 1” sq inch (144th scale) needs to be modeled. Lots of people do put a lot of work into the superstructure to make it look good and there is a best of scale award at NATS. Some people do the minimum required and make it more durable and don’t get as worried about getting them destroyed. What's the best way to do it so that it doesn't get shot up? ABS plastic is bb proof and light weight. It is easy to cut and glue together, use ABS specific glue. A good choice for any class of ship. Some of the heavier ships also use 1/16” or 1/8” 5 layer plywood. Some people also use 2 mil sheet styrene for the vertical surfaces. Some materials like styrene and PVC will be more prone to crack or shatter when hit by a BB. What's the best way to apply the silkspan and balsa to the hull? Contact cement (brand name Weldwood). CA glue gets too brittle but will do in a pinch. Good sheeting starts with good balsa wood. The good sheets can be rolled into a tub length wise without cracking or feeling too rigid. They should feel soft. When hit by a bb the balsa should let it pass easily making a small hole rather than a giant splintering crack. Most people put two layers of silkspan on the inside of the hull and one layer on the outside. The silk span is held to the balsa with contact cement or dope. What are some common sheeting failures? Bad balsa, bad balsa, bad balsa. It’s the difference in tiny holes and splintering gashes. Over time the sheet will peel away from the hull in places and need to be glued on again. Once in a while if you thin the material too much he silk span will pull away from the balsa. What is it, why do I need it? Internal armor is a bb proof layer just inside the hull that prevents the internals from taking damage. Any one who has done this long enough will have seen a magazine get dented or a power switch turned off. Some of the more fragile components like the soft brass magazines should have additional protection on the inside. Internal armor also prevents bbs from going in one side and out the other, you don’t want to take 2 for 1. What's the best material for internal armor? The best, and most easily available armor material I've found is available at your local grocery store, in the form of 2-liter soda bottles. Very light, very durable. Buy several, enjoy the contents, and then cut the bottles into strips. Screw the strips onto your ribs. Make sure that there are no large open gaps, or cracks where bb's can get through, and that the armor extends from below the impenetrable area at the bottom, to high enough that a bb cannot pass through on the top, either. Likewise, at the bow and stern, there should be no room for bb's to pass through the hull skin. At the same time, there needs to be open area beneath the armor at the bottom, so that it doesn't trap water and cause your ship to list and sink. You can also use shower pan liner, a material intended to prevent water damage if your shower or tub leaks. Get it at a home improvements store like Menards, Lowes, or Home Depot in the shower isle. It works just as well but is heavier then the pop bottles. Guerilla tape can work well in very light ships that don’t take fire vary often. Use 2 layers and test it to be sure you have the brand that works OK.
What are some common armor failures? Poor material choice: inferior plastic mesh, plexi-glass, or other armor cracking and breaking up into pieces after repeated impacts, allowing rounds to pass through the wreckage. Inadequately secured armor coming loose and flopping around inside the ship, allowing rounds to pass by it. Armor that's not adequately fastened at the bow or stern being blown out through the other side by triple stern gun fire. Large gaps in the armor, or between armor pieces allowing rounds through between them. Armor which is so rigid that it causes the bb's to bounce back out through the hull skin, leaving a nasty exit hole. What gauge of wire is best to use? Depends on the application. 12 or 14 or 16 for the main wires and the pump. 18 or 20 for the guns and lights. The bigger the ship the bigger the wire. Large battleships with high current motors need 12 or 14 gauge for the main wires to the batteries. NO, KISS principle. If you wire your ship correctly you should not have shorts or overloads in your wiring. How should I prevent water damage to connections? Solder everything. Never use crimp on connections. Never use spade connectors meant for in commercial wiring. Use Dean’s Ultra connectors for large power draws and Dean 2, 3 or 4 pin micro plugs for smaller loads, like guns. Power Pole connectors also work well for the larger loads. Make sure and flush your wiring with fresh water after a day of battling. Some ponds have corrosive chemicals that will over time corrode the wires. What are some common wiring failures? Bad soldering, bad soldering, bad soldering. Learn to pre-tin. Not covering connections with heat shrink or liquid electrical tape can lead to bbs arcing the connectors causing shorts. Your ship will need maintenance and trouble shooting, keeping things neat, color coded, and organized helps. Towards the rear of the ship. Used in the sense of direction such as, "I went aft on the ship." A cannon which fires into the 30o bow arc. Generally, these cannons appear only on class 3 and lower ships due to safety reasons. These cannons are good for distance sniping and shooting targets in campaign battle. Sometimes referred to as a "bow gun". The 30o area of the bow 15o to each side of the longitudinal centerline of the ship. This is the location where bow cannons are aimed. A side-mounted cannon that is in the bow of a ship. Good cannon for pursuit to finish off a wounded enemy. The area of a cannon which restricts the movement of the BB until such time as enough pressure builds up behind it to fire. Heavy Cruiser. A cruiser with 8” or larger guns. Has nothing to do with weight of the ship. Light Cruiser. A cruiser with guns under 8”. Has nothing to do with weight of the ship. An armored area on the side of a ship which usually holds smaller guns. An area often ruled as impenetrable in our hobby. A common mistake when trying to refer to casemate. The reservoir which hold the liquid CO2 within the ship. The surface that sits on top of the hull and supports turrets, superstructure and any detail a captain may wish to add. In the past, many navies used wooden teak decks due to its durability. In our hobby, the deck is often made from aircraft ply. A paint used to attach silkspan to the balsa sheeting which renders it waterproof. Electronic Speed Control. Provides forward & reverse movement in increments allowing for easier speed setting. A silicone tube design which restricts the BB's travel until enough pressure builds up to fire it. Virtually maintenance free. Also referred to as a "restrictor breech". Maintenance free battery which has the dielectric in a gel form. Larger and heavier than other battery types but they contain massive capacity which explains the popularity for this type of battery in the larger ships. Cannot be fast charged. The act of quickly bringing a battery to capacity with a specific charger. Normally reserved for NiCad batteries but some NiMH batteries can now be fast charged as well. Also referred to as "quick charge". Refers to a large open pond, also a long pond where fast ships have an advantage over the slow ships. Has nothing to do with the water. See Slow Pond. BBs & BCs that are 24 second speed rated. Also CAs & CLs of 22 & 23 second speed. See Slow Ships. You're almost guaranteed to hear this at least once during each sortie. When a captain has lost control of his ship, be it steering, propulsion or an accidental beaching...he's allowed to call "Five Out of Control" and to start his 5-minute timer. Unlike calling "On Five", the captain of a ship that's on "Five Out of Control" can still shoot his cannons if they still work. After his five minutes are up, he's allowed to remove his ship from the water. Captains on "Five Out of Control" are generally very popular with the enemy. The phonetic spelling of forecastle. Towards the front of the ship. Used in the sense of direction such as, "I went fore on the ship." Area of the deck near the bow. Originally an actual castle structure built on warships. Also called focsle (foc-sil). The amount of space from the waterline to the deck. Generally, the lower a ships freeboard, the harder it is to hit. But conversely, the lower a ships freeboard, the less reserve buoyancy available to survive a mishap. The point where the deck meets the hull. Fitting to hold and retain small diameter hose which is used to plumb the pneumatic system within a ship. The portion of the ship which displaces water so it will float. This is the basic item each ships starts out with be it a fiberglass hull from a commercial distributor or a wooden scratch built hull. Thin plastic sheeting placed at least 1/4" behind the balsa sheeting inside the ship. This prevents a BB from entering one side of the ship and exiting the other. Also provides protection for internal components. An internal piston within a cannon which prevents more than one BB from firing at a time. The longitudinal centerline of the ship. Generally the lowest portion of the hull under the water. Due to the MWC safety rules, whenever an individual enters the water, for any reason, "Man in the Water" is called. Everyone engaged in battle immediately ceases all firing and moving until the "Resume Battle" is declared by the Contest Director. Structures to hold a platform high above the water in order to facilitate viewing of enemy ships on the horizon. Device which converts electrical energy into mechanical energy. Commonly used for propulsion and in pumps. Rechargeable battery based on Nickel and Cadmium. A high capacity to weight ratio which explains their popular use in small ships. Often capable of being "fast charged". Rechargeable battery Nickel Metal Hydride. A high capacity to weight ratio which explains their popular use in small ships. Better then NiCad. An o-ring is compressed to restrict the travel of a BB through it. Requires more maintenance as the cannons often need to be "tweaked" before battle but seems to provide a more powerful punch. The most common breech. Is called when a captain wishes to leave the water but before he can do so, his ship has to remain on the water for a period of five minutes. When his timer has expired, he can remove his ship from the water. During these five minutes, he is forbidden from firing his cannons. This makes people who call their five early in a battle a choice target. A small class 4 or 5 ships that is slow and turns very well. Generally refers to German WW1 ships like Westfalen, VDT & Baden. Pneumatic switch which allows the flow of CO2 to flow to a cannon when a mechanical manipulation of the valve occurs via servo. The left side of the ship while looking at the ship stern-on. Opposite of "starboard". The 150o area to the port side of the ship centered perpendicular to the longitudinal centerline of the ship. This is the location where port side-mount cannons are aimed. Device used to remove water from the inside of a ship. An opening 1/8" wide which allows the water to exit the ship from the pump. The act of quickly bringing a battery to capacity with a specific charger. Normally reserved for NiCad batteries but some NiMH batteries can now be quick charged as well. Also referred to as "fast charge". Electronic components which allow one to control the workings of a ship. Often contains a transmitter, receiver and servos. Called whenever a captain believes he was damaged due to ship to ship contact. The ship is returned to shore and the captain is allowed to examine his ship for damage. A bow which was designed to cause below the waterline damage to another ship when it was rammed. These bows all have extended bows below the waterline. Good examples are the HMS Invincible and the SMS Nassau. Device which attaches to the CO2 bottle to bring the ambient pressure from 800 psi to a more reasonable and safe 150 psi. A silicone tube design which restricts the BB's travel until enough pressure builds up to fire it. Virtually maintenance free. Also referred to as a "geek breech". Vertical plane beneath the water to redirect the flow of water from the props which turns the ship. Device which turns radio controlled electronic commands into mechanical movement. Used to control most aspects of a ship such as steering, throttles, cannon firing, etc. The 1/32" balsa which covers the windows on the hull. This allows a fired BB to easily penetrate and cause a hole. A side-mount is a cannon which fires into the 150o degree starboard or port arc. These cannons are generally angled down to deliver below the waterline damage. Due to the MWC safety rules, side-mounts are only allowed on class 4 and higher ships. Thin tissue like material used to coat the inside and outside of the balsa sheeting to improve its strength and waterproof capabilities. Often used with "dope" during the waterproofing phase of sheeting a ship. Grade 00 is widely accepted as the perfect choice for penetrability and durability. An area of the hull extending from a feature such as the keel towards either the props or rudder of a ship to provide hydrodynamic flaring and thus lowering drag. A small pond or a pond with a narrow channel, bay(s) or other structures that give slow good turning ships an advantage. Does not refer to the water. See Fast Pond. Ships rated at 26 or 28 second speed. The right side of the ship while looking at the ship stern-on. Opposite of "port". The 150o area to the starboard side of the ship centered perpendicular to the longitudinal centerline of the ship. This is the location where starboard side-mount cannons are aimed. A cannon which fires into the 30o stern arc. Most ships arm at least one and they are very popular as they can generally be mounted lower then a bow cannon. Also, when you're shooting at an enemy with your "sterns", you present a very small target in return. Sometimes referred to as a "stern gun". The 30o area of the stern 15o to each side of the longitudinal centerline of the ship. This is the location where stern cannons are aimed. A side-mounted cannon that is in the stern of a ship. The most dangerous cannon as, if used properly, it can sink an opponent very quickly. This cannon generally discourages captains from chasing a ship which mounts one. Know as a Haymaker. A narrow horizontal support between ribs on the hull to facilitate attachment of the sheeting. Usually based on hull shape such as bulges and armor belts. While sailing along you accidently run over a patch of moss. As luck would have it, your props become fouled with the stuff and your movement rate drops dramatically. Basically, you're a dead duck. What do you do? Since the rules state that you can't touch your ship until a period of time as expired, the "30 Second Moss" rule can be used. After calling "30 Second Moss" and starting your timer, you have to wait 30 seconds before you can bring your ship in to clear your props or wade out to get your ship if it is stuck in the moss. Let's face it...hearing these bad boys going off is impressive. Generally they do a LOT of damage above or on the waterline of a ship. They are very effective if the enemy starts taking on water as all the above the waterline damage will soon be below the waterline which all but guarantees a sink. Triple sterns generally appear on the larger ships within the hobby. Just about every captain (with o-ring breach cannons) tweaks their cannons before each battle. This is to make sure the cannon is firing at its maximum strength without seizing up. Some captains are better at tweaking than others as it's more of an art form. A measure of how many cannons or pumps a ship can have. Based on a ships size and capability, the number of units ranges from 1/2" unit for the smaller ships to 8 units for the largest. A unit can either be a working cannon with a 50 round magazine or a pump with a 1/8" outlet. The line at which the water rest against the hull while a ship is at rest at a specific weight. The act of rendering something impervious to water damage. Often involves coating an object in a special plastic-rubber compound.